For using QODBC with Tableau Desktop, You need to use QODBC V 18.0.0.326 or later version. In case you are using an older version of QODBC, please upgrade your QODBC to the latest version. Click here to download the latest version of QODBC. After installing QODBC latest version, We need to enable ODBC 3.8 compatibility from QODBC Setup Screen >> Advanced tab. 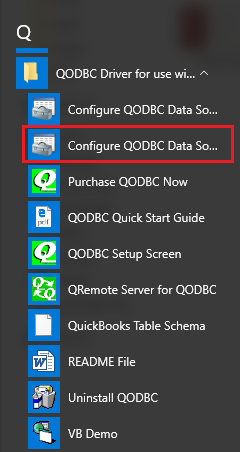 Navigate to Start Menu, QODBC Drivers for Use with QuickBooks and click "Configure QODBC Data Source"
Navigate to "System DSN" tab & select "QuickBooks Data" & click "Configure"
Note: In case you are using user-defined DSN, then you need to make changes in your user-defined DSN. QODBC Setup Screen will open on clicking configure. Now, Please navigate to "Advanced" tab. Please change "ODBC Compatibility" to "3.8" from "Default" & "Apply changes". Now, Open Tableau Desktop, Navigate to "To a Server" & select "Other Databases (ODBC)" option. In Other Databases (ODBC), Select "QuickBooks Data" data source and click "Connect". Tableau Desktop is connecting to QODBC. Tableau Desktop is connected to QODBC. Click on "Sign In" to move ahead. QODBC connection is added Tableau Desktop. Now, Write any table name which you want to use & click on "Search" icon. In this example, I have written "Customer" table name. "Customer" table is added in Tableau Desktop. Double-click on the table name to see table schema. Now, click on "Sheet1" to add table data in Tableau Desktop sheet. Tableau Desktop will show ODBC connection warning, Click "OK" to continue. The customer table data is added to the sheet. Click "Data Sources" for the list of available table fields. Now drag any table field in the sheet which you want to show. In this example, I have added FullName field from "Dimensions" & Balance field from "Measures" in the sheet. You will notice that Customer FullName & Balance is loaded into the in the sheet. You can choose the different option from "Show Me" to see QuickBooks Data as per your requirements.